DaanKutth – Home is where the hearth is. Yep. So if you had to pick one dish that you would then have to eat everyday, what would it be? Yep. One dish. Every single day. I know the first thing that’ll probably come to your mind is probably something elaborate and beautiful and rich – ristas! biryani! korma! – yes? But every day? Forever? I think we forget that we love some of these dishes so much precisely because we eat them only occasionally. I mean the first wazwan of the season is *OHMYGOD YES*, but pretty soon we are all dying and cannot beat the thought of any more (yes, even tabakh maaz). No? So, coming back to my original question – my dad says that he thinks the food of paradise will comprise of the following : white rice, tchhatte haakh, yoghurt. And I think he’s got something there. Something you’d happily eat every single day. Forever even. And that just tells you something about the joy and comfort of haakh for Kashmiris. Tchhatte haakh is the simplest thing in the world and yet so hard to get right. Not everyone can take a bunch of spring greens and turn them in to this beautiful, bright green love fest. And the truth is no one makes better tchhatte haakh than my mum. It’s taken me years of practice, even when using her recipe, to come to a point where it actually works – it’s green, fresh, flavoured delicately and minimally with fresh green chillies and garlic. Thing of absolute beauty. Promise. And If you are not Kashmiri, this recipe will change the way you look at your spring greens, forever. Promise. Okay then, now that we’ve used words like forever and promise and eternal in a recipe for haakh, let’s get to it, shall we? So first of all, you need to prep your greens. Break stems off the bulb, put them in a colander and wash thoroughly. You are not going to chop the leaves, just roughly tear them up in to 2/3 bits, depending on how big the leaves are. Next, take a big wide thick bottomed pan and fill it with water. Bring this to boil. What you are going to do is blanch your greens. So as soon as the water comes to a rolling boil add the greens pushing them in to the water. Now wait till the pan comes to a boil again. And then count to, let’s say, 11, shall we? Turn the heat off, drain the greens immediately, and run under cold water. And then drain again. This step right here will make or break your haakh. If you do this right your haakh will stay a beautiful vibrant green. If you dont, well, good luck with your khaaki haakh. Hah. Now in another pan heat some oil up. To this add your blanched greens, little by little. Once all in, add the cloves of garlic and green chillies. The greens will be wet, so there will be a bit of water in the pan already, add a bit more, and cook on a high flame for a few minutes, then turn the flame right down, cover and cook till the greens are melt in your mouth tender – with spring greens this is usually 10 mins or so, sometimes less. There, you are done. All you now need is a plateful of fluffy white rice, and a bowl of homemade yoghurt. Paradise. Right in front of you. So, honestly, I have often wondered why Kashmiris don’t eat more fish. The place is full of fresh water lakes and rivers. Fresh water fish, everywhere. And given conclusive proof of what we can do with just one ingredient – umm, hello Wazwan? – I have always thought it strange that there is really only one traditional way to cook fish. Ah, but like my dad would say, why mess with perfection, why try and reinvent the wheel, etc..
Kashmiris cook lamb/ sheep pretty much everyday, yes? And in a million ways – with shallots, yoghurt, vegetables, lentils. So it’s not even a conversation. Everyday there will be *syun* with which to eat the *batte*. Batte – our word for rice, is also our word for lunch/ dinner/ a meal. 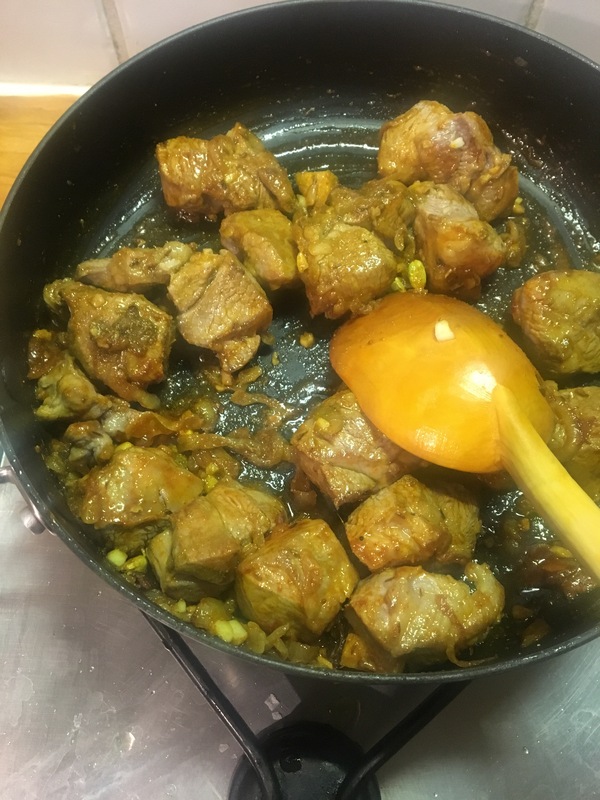 And Syun – our word for what you eat the batte with – almost always some sort of lamb/ sheep dish. It is a rare day indeed when you ask someone that universal eternal question : *syun kyah chhuv ronmutt? * (which roughly translates to what have you cooked today? ), and they say *gaade*! But if they do, uff, it’s your lucky day. Kashmiri fish curry – for want of a better word – is like nothing you’ve ever eaten before. We only cook fish in the autumn/ winter/ early spring months. No one eats fish in the summers. If the name of the month doesn’t have an R in it, you don’t eat fish in it. It’s the law. What? And Kashmiri fisherwomen really do deserve a post all to themselves. The sassiest, cheekiest, most beautiful women you’ll ever see. In their pherans, the daejj/ scarf hanging loosely on their heads, and that big basket full of fresh fish balanced expertly on a ring made of hay, (is it? ), which I always thought was a crown. They do the rounds early morning, just after having caught the freshest fish from your nearest lake/ river. And when you call them in, they’ll scale, gut and clean your fish right in front of your eyes. But the thing is of course that I live in London. And the fish you get here in the supermarkets – well you can pick stuff that’s scaled, gutted even filleted. So easy. But where’re the fun in that, eh. Anyway, I digress. This post is obviously about to make your day 100% better. Because this post will show you how make the most delicious fish. Ever. 3-4 White Radishes (mooli in Urdu/Hindi, mujje in Kashmiri) – scraped, washed and chopped in to 1/2 inch thick rounds. I used whatever leaves these had on as well. Spring greens (Haakh) – washed, roughly torn. Kashmiri spice paste – this is called vaerr, and will take this, and every other dish you ever make, up several notches. First of all what you need to do is take a thick bottomed pan – since we are essentially deep frying here, a kadhai/ wok will work best. Pour in a generous amount of oil, and make sure it is super hot, before adding your fish to the pan. Now remember we are deep frying the fish, in batches if necessary – don’t put everything is there all at once. Just don’t. Also be aware that this will splutter. A lot. So a splatter guard, or a plain old lid is critical. What you are trying to do is deep fry the fish till the pieces are a deep golden-reddish-brown, and the flesh is pretty firm. Using a slotted spoon take the fish out. Now in to this same pan, add your sliced radish slices, and fry them, not for too long, on both sides till they are slightly golden in colour. Again batch fry these, a few at a time, depending on how big your pan is. Use a slotted spoon to take them out and put them aside. Now do the same with your kohlrabi chunks. Once these are sort of golden, take them out too. Basically repeat this step with any and all of the veggies you are using. At the very end put the greens in and sizzle fry them for a few minutes. At this stage you now have a variety of fried goodies looking lovingly at you. Sigh. Next, you need to make the spice tempering. 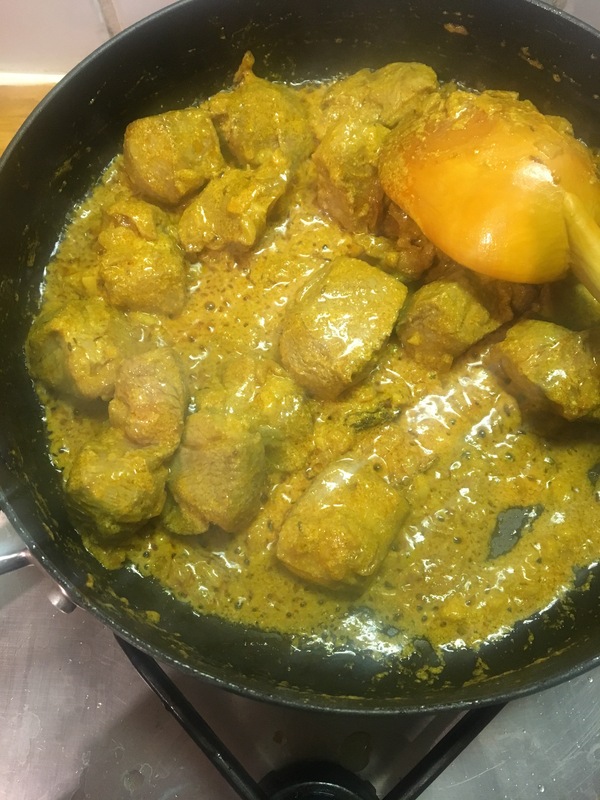 For this, look at the remaining oil in the pan – get rid of the excess, leaving just enough behind to make your masala tempering (you want the equivalent of about 5-7 tablespoons of oil). In to this add your shallots. Fry till they’re soft and translucent. Add all your whole spices and fry for another couple of minutes till everything is nice and fragrant. Then add your crushed garlic, and fry for another minute or 3. Finally add all your ground spices and fry those for a bit. Turn the heat off. If you have managed to find some vaerr and are feeling particularly brave then break a chunk off, put it in a bowl and pour a little boiling water on it. Use a spoon/ fork to sort of dissolve the vaerr in to a thin paste. Now comes the funest part! Take a deep thick bottomed pan. And start of by arranging your fried radish slices all over the bottom. Top this off with a layer of fried fish. Then spoon some of the masala tempering all over. Then next layer – of the kohlrabi. Then the fish again. Then the spices. And so on and so forth till you’ve used all your goodies up. Except for the greens. The greens go right on top. Then pour the last of your masala. And then pour your vaerr paste all over. Now all you need to do is add a bit of water. Say a cup or so, and put your pan on a high flame to bring everything to a boil. Oh and add salt to taste. At this stage cover and simmer, on as low a flame as you can, and let it cook for at least an hour. Huge deghs of fish would apparently be cooked overnight. But we’ll settle for an hour, eh. That’s it you’re done. Serve with plenty of fluffy white rice. But remember, ideally you’ve got to let it cool down to room temperature before eating it. Oh and it ALWAYS tastes better the next day. So if you are not from Kashmir, and if you have been following my blog, then you know by now, hopefully, that when I say Yakhni, (or Yakhyin in Kashmiri) I do not mean what most people in North India/ Pakistan mean when they use that word. The north Indian Yakhni is basically a broth. 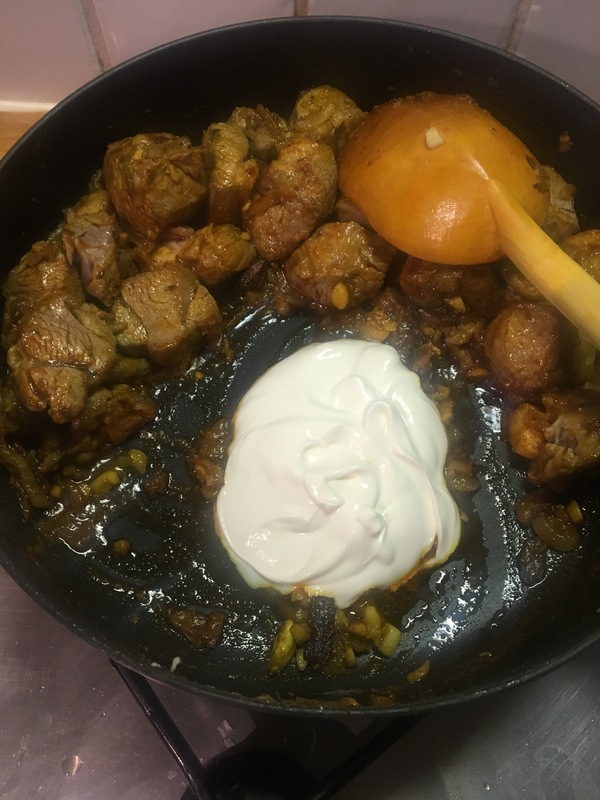 The Kashmiri Yakhni is a mild, creamy, yoghurt-y base, used mostly to make the always amazing lamb yakhni, but – and here’s where it’s beauty lies – you can make a Yakhni with pretty much anything. Alle, or doodhi, or bottle gourd is a Kashmiri favourite to do the Yakhni magic on. Aubergines too. But let’s stick with Alle for the time. 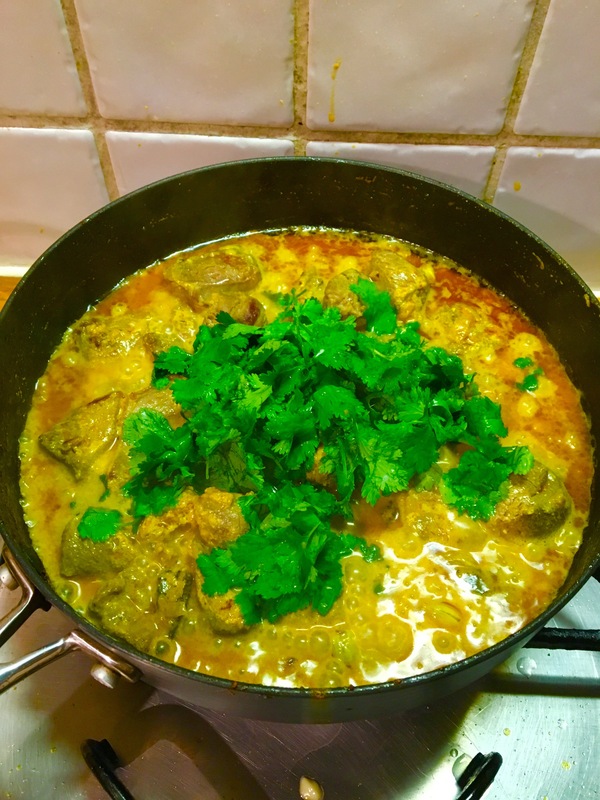 But if I go a little further back than my time in the north Indian plains, back to my childhood in Srinagar, alle – on their own, as a yakhni, with lamb – were much loved in my mum’s kitchen, and so good too. So anyway, the point is I’m going to hopefully start doing more with these beauties. Should we begin with the Yakhni? Good. 2-3 medium sized bottle gourds – scrape the skin off, split them lengthwise, get rid of the fluffy seedy bit inside, and then cut in to chunks. So you know how to get the yoghurt cooked down for our Yakhni, dont you? (You dont! You havent read my original Yakhni post? For shame! Click. Now.) So let’s assume our yoghurt is all cooked down, and ready. What you need to do next, is fairly simple. Take a wide, thick bottomed pan, and put it on a high flame. When the pan is hot add a good glug of oil. And when that is hot, add your bottle gourd chunks. Fry them for a few minutes on the same high flame, stirring gently. Then sprinkle a bit of salt all over them, cover and bring the heat down to medium. What this will do is make the bottle gourd chunks sweat. Let them cook in their own juices till everything is almost dry. Do check from time to time to make sure your alle are not getting scorched – you might have to adjust the heat accordingly. Now once the vegetables are all dry and you can see oil in the pan again, what you do is let them fry for a couple of minutes – it’ll all be fairly soft by now, so be careful not to turn it in to a blooming mash! Next take the bottle gourd chunks out of the pan, in to a bowl. In to the same pan, add 2 of your sliced shallots, and fry them, on a medium flame, till they are translucent and soft. Then add the crushed garlic, and fry it all together for a minute or so. Next put all your whole spices in, and fry them for a minute or two. Once the spices are nice and fragrant add your turmeric and fennel powders, if using them. Stir everything together. Now return the fried bottle gourd chunks to the pan, and stir carefully making surely all your chunks are coated with all those lovely spices. Fry everything together for a minute or two. To this then add, say about a cup of water, maybe a bit more depending. Mix everything up and bring it to boil on a high flame. At this stage all you need to do is add your prepared Yakhni yoghurt reduction, and stir everything together. Check for salt. This last step here is optional but will take this up a significant notch. Or ten. In a small frying pan heat up a tablespoon of oil. Add your one remaining sliced shallot, and fry on a high flame till the shallots are completely caramelised and almost black. Take your pan off the heat, and pour this tempering all over your Yakhni. Garnish with dried or fresh mint. That’s right, you are now officially in love with doodhi. I know. Okay, so this one’s been a long time coming, and isn’t so much a recipe as it is a weekday dinner improvisation. So what happened was that it was a Monday night, we had just come back from our weekend away in Paris, I had a box or two of DaanivalKorme in the freezer, and suddenly felt like the Universe was whispering in to my ear that magical word Kashmiris hear only once in a while — Pulao. If you know anything about Kashmiris by now it is that we are big rice eaters. And that when we say rice, we mean rice – plain, cooked, white rice. No fancy shmancy pulaos and biryanis for us. Except on that rare occasion when the Universe whispers certain words in to our ears, you know. Just to give you an idea of how down on our list of *things to do with rice* Pulao is – you know Wazwan, the definitive Kashmiri feast, a proper-sit-down-at-least 7 course meal, each course more refined, more spectacular than the one before – all of it served with plain white rice – in that feast of indulgence and excess Pulao is served as an accompaniment alongside an assortment of chutneys – and for a traami of 4 people there is just enough for each person to get one mouthful. Basically. And that’s it. And Biryani, you say? I say, what? Anyway, you get the point. It was a very unusual Monday night. I had no fresh meat to hand. But I had DaanivalKorme in the freezer. And I had rice, soaking, as usual. So here’s what I did. 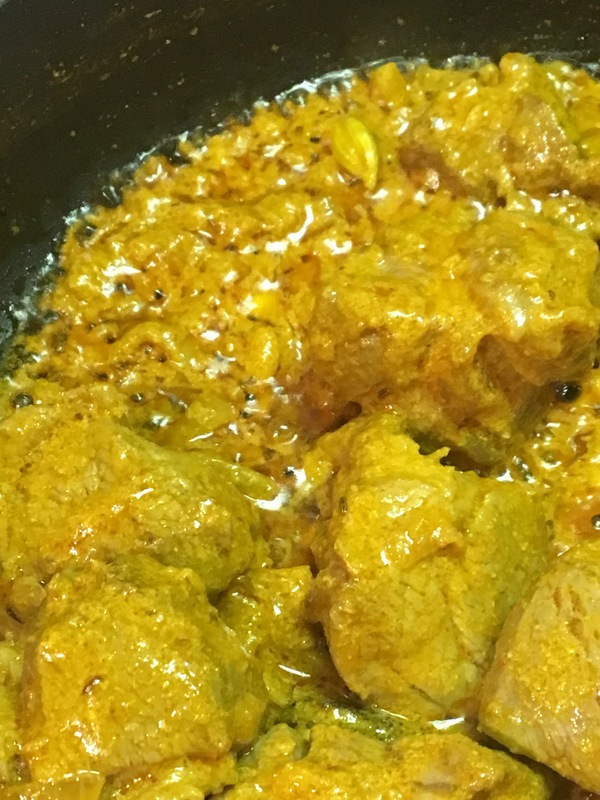 So take a deep, thick bottomed pan, and pour in a glug of oil – remember though, your Korma already has oil in it, so don’t over do it. Once the oil is hot add the cumin seeds, cardamoms, clove, and pepper corns. After about a minute or so add your sliced shallots. These you want to fry till they are completely caramelised and almost black. You’ll have to work quickly when you come to this stage because there’s a very fine line between perfectly done shallots and burnt shallots – I’m sure there’s a life lesson in there, but anyway. Add your peas, and fry for a minute or two. In goes your frozen Korma. Add a bit of water, bring it to boil on a high flame, and then basically let it simmer till the korma has thawed and heated through. This will take about 10-15 mins. What you do next is our all of your korma out in to a bowl. Drain and rinse your rice, and put it in the same pan. To this add the pieces of meat – use a slotted spoon so that you don’t get any of the gravy in at this stage. Then measure the gravy out using the same cup that you used to measure the rice. I got about 2 cups of gravy. So I added those, and then 2 cups of water. You’re looking for a 1:2 ratio between rice and water here. Mix everything up, gently – you’re rice has been soaking, if you arent gentle it will break and you wont get that lovely long grain effect. Check for salt. Then bring everything to boil on a high flame. Cook uncovered for about a minute. Then cover, simmer and cook till the liquid is all gone and the rice is tender – about 15-20 mins, but it pays to check. That’s it, really. You’re done. You could add other vegetables – sliced carrots, beans, whatever you want – to the fried shallots, and turn this in to a real one-pot dinner, but hey rice, meat, maybe peas – the Kashmiri in me didn’t want to mess with that kind of perfection. Plus shallots ARE vegetables, aren’t they. Ahem. And if you are really lucky, if you have been really good, then maybe you will get a bit of the *phoherr* too. What is that you ask? You really should learn Kashmiri, you guys. But anyway, phoherr is the layer of rice at the bottom of the pan, that basically gets overcooked, and in a *pulao situation*, ahem, fried to a lovely, crunchy crisp. You never serve that to your guests of course. Because, you know, it doesn’t look great, the perfectly cooked pulao, or indeed rice should have no phoherr, and because YOU WANT TO KEEP IT ALL FOR YOURSELF. Hah. And you can see I ate mine with, ahem, tomato koftas (recipe here – what can I say, it’s your lucky day. Ahem). Because tomatoes are vegetables, or fruits, or whatever – and there is no such thing as too much meat. Clearly. Oh and I also dotted mine with salted butter just before I served it. Because you know, ButterMakesBetter. Fact. Fast forward to years later when I was visiting one of my aunts and she insisted I tell her what to cook for dinner – she wanted to make something I really liked. So obviously I said DaanivalKorme. Imagine my surprise when she brought this pale yellow, nearly white, coriander curry on to the table that night. I thought it looked like Yakhni, with coriander. And that’s when I realised that the DaanivalKorme my mum makes is her very own take on the classic recipe, which indeed is pale white and has no chilies in it at all. Ah. The classic is lovely of course, but I have to say I much prefer my mum’s version. So basically, this is your lucky day. Ahem. 500 gms of lamb – any cut really, but you know how I feel about a bit of fat, a bit of bone, eh. 400 gms of yoghurt – natural full fat yoghurt. Though I have to say Greek yoghurt is a dream to cook with. You want your yoghurt to be smooth and lump-free, so stirring it well is a good idea. Big bunch of fresh coriander – get the leaves off, wash, drain. Wash you meat and put it in a thick bottomed pan with all the whole spices, whole garlic cloves, and fennel powder. Pour in enough water to cover the meat, and then some. Add salt. Bring everything to a rigorous boil. Cover. Simmer. And forget about it for about one and a half/ two hours, till the meat is terribly tender and falling off the bone. In another pan, heat up a generous glug of oil, and to this add you shallots. Fry on a medium flame till the shallots are soft and translucent. Add your minced garlic, and fry for a couple of minutes till fragrant. Now turn the heat right down and add turmeric and chili powders (- you really do need Kashmiri chili powder for the colour here, others will give you the heat, of course, but not the prettiness). Fry for a minute or so. At this point what you need to do is put your yoghurt in, a little at a time, (this step is quite similar to how we cook yoghurt down for the RoghanJosh, by the way) cooking it down till you can see oil in the pan, before adding more. Add a big handful of coriander leaves along with the last of your yoghurt, and then cook it down as before. Smells so good, doesn’t it? 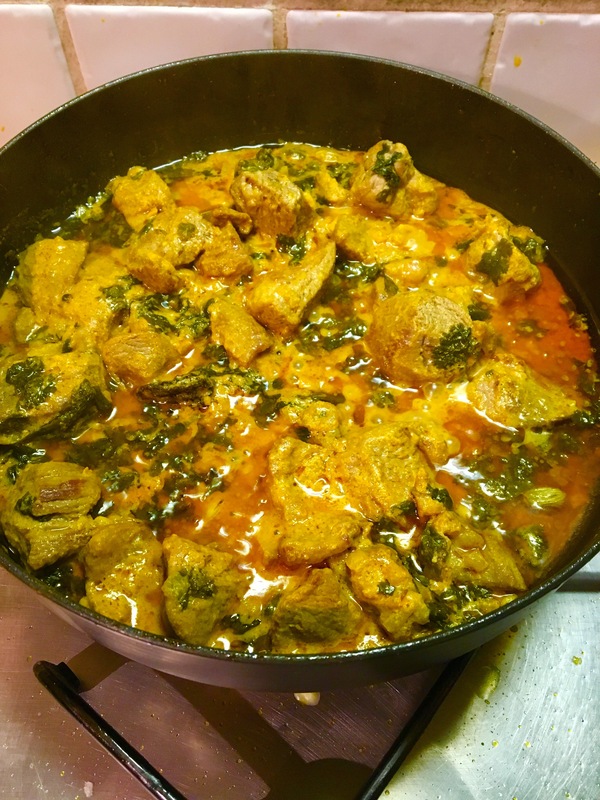 Now what you want to do is add your meat, along with the broth its been cooking in to your yoghurt/ coriander base. Give everything a mighty old stir, check for salt, bring to boil, add the rest of the coriander – just save some for garnish, if you’re in to that kind of stuff – cover and simmer for another 10 or so minutes. Take a big thick bottomed pan and heat a generous amount of oil in it. Add your shallots to the pan and fry till soft and translucent. Next add the meat and fry it lightly on both sides. Next add all your whole spices and fry them for a couple of minutes, and then add the garlic (all minced). To this add your powdered spices and fry for a minute or two. Then all you need to do is add the yoghurt to the pan, a little at a time, cooking it down till you can see oil in the pan, before adding more. Add a big handful of coriander leaves along with the last of your yoghurt, and then cook it down as before. Then add enough water to cover everything, bring to boil, cover, simmer till the meat is tender – 1-1/12 to 2 hours. Keep checking to make sure there’s enough water in the pan though – no one will thank you for scorched DaanivalKorme. Ahem. So you know I’m from Kashmir. Which means I know a lot of, you know, Kashmiris. Ahem. All sorts, really. Village folk. From the north. The south. City people. Downtown-ians. Civil liners. Every single shade of the political spectrum. Ahem. They don’t always agree on things. They will sometimes slag each other off. In ways that are sometimes subtle, sometimes not. You know. But what if I tell you there is one thing that is true of every single Kashmiri I know. Like, you know, all of them. What is it, you ask? Would you like to take a guess? No, we are not talking about politics. Ahem. (Yes, you’re probably right. Ahem.) They all *love* turnips. It’s true. Every. Single. One. Of. Them. Even my 7 year old who’s more London-ian than Kashmiri. It’s in our DNA, obviously. What other explanation can there be. Ahem. Okay, so the point of all that was this : Turnips – On their own. Fresh. Dried. Amazing. But Turnips with lamb – next level. Thing of beauty. And joy. Obviously. 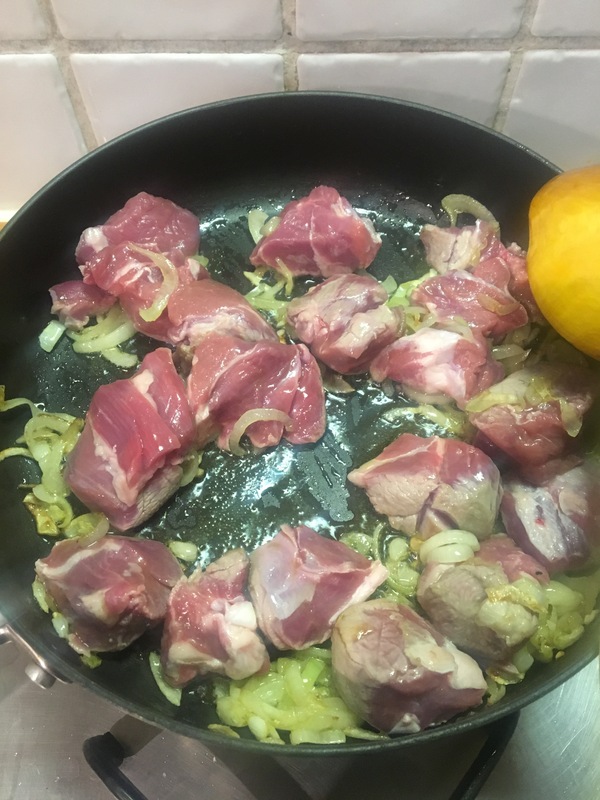 500 grams of lamb – this works with pretty much any cut. I used boneless chunks of leg because that’s what I had. A bit of bone will add lots to the flavour though. 7-8 medium turnips – pick the smaller ones out at the grocer’s, they’re sweeter and cook quicker. Okay, so first things first – wash your meat and put it in a big enough thick bottomed pan. Add all your whole spices, 2 whole cloves of garlic, fennel powder, and salt. Pour enough water to cover everything, in to the pan. Bring to boil on a high heat, cover, and simmer. And do what we do with pretty much every single lamb recipe : forget about it for the next 1.5 to 2 hours, till the meat is super soft and tender. So by this point if your lamb is all done all you need to do is add it to the turnips, bring everything back to boil, check for salt, cover, and cook on a medium/ low flame for another 10 minutes. If your lamb is still cooking, take the turnips off the heat and wait till your lamb is done before you do the whole mixing bit. And that’s it. Every Kashmiri’s comfort/ soul/ love food. Promise. Sea bass with ginger and garlic. So you know the way Kashmiris cook fish is pretty epic – chunks of fresh water fish, trout is a favourite, are deep fried, then layered in a deep pan, with various seasonal vegetables, and a spice mix, and then the whole thing is cooked on slow heat for hours, sometimes even overnight – and obviously the way it tastes is even more epic – the fish is melt in your mouth tender and the vegetables have this other-worldly flavour that is impossible to describe. Sorry to lead you on a bit, but this is not a post about Kashmiri fish. What? Did you not read the title? What I’m trying to say is that my fish-standards are pretty high. But this recipe, right here, lives up to even those. Add to this the fact that this recipe does not take hours, and is in fact one of the quickest, easiest ways to get a super delicious, healthy dinner on to the table in less than half an hour. Yep. Winner. 4 SeaBass fillets – you could use the whole fish cut up in to pieces, but the fillets are easier to cook, and lets face it no bones = easier to eat. So this is easy peasy. Take your fillets, wash and scale them (fillets are usually scaled but hello I am Kashmiri – no point cooking fish unless you scale it. Hah). Next with a small sharp knife score your fillets. Then season them generously with salt and pepper – both sides. Next what you want to do is heat up a frying pan. Once it’s hot, add some oil, not too much, but enough to cover the pan. In to this add your fish fillets, skin side down. You might have to do this in batches, depending on how big your pan is. This will splutter a bit, so be aware of that. This fish cooks quite quickly, but don’t be tempted to flip it to the other side too soon. Let it cook on the skin side for a good 5-7 minutes, maybe even longer depending on how hot your flame is. Once the skin is nice and crisp flip over, carefully, to the other side and cook for another 3-4 minutes. Once the fish is cooked, take the fish out – carefully because you really don’t want to break it now, do you – and transfer it to the serving dish (cover with foil to keep in warm). Now, in to the same pan add your shallots, and fry till soft and translucent. To this add your garlic and ginger, and the green chillies – make sure the flame is high so you get a nice sizzle on. Once the garlic starts changing colour – 2-3 minutes – bring the flame right down and add the spring onions. As soon as the spring onions heat through turn the flame off and then add a dash of soy sauce to the pan. Give everything a little stir and pour all over your waiting fish. You can, if you want garnish with a bit of coriander, but you really don’t need to. This is so yummy that there have been times when it has been eaten straight out of the serving dish. But if your self control is better than mine, ahem, this is beautiful served with white rice, or if you are watching those carbs even with a side of stir fried vegetables. Did not have spring onions to hand which why you don’t see them in these pictures. And while this is recipe is superb even without, spring onions do take it to the next level. Like I said, I make these pretty much every week. And I promise this is an easy recipe – kitchen to table in about an hour. Also, I must say, that I use a couple of spices in this recipe that are not traditionally used in Kashmiri cooking. Coriander seeds, for example. I feel that these and black peppercorns add a lovely depth to the flavours here, though. But please do feel free to leave these out if you prefer a more traditional flavour. 1 kilo of good quality lamb mince – find a butcher who sells organic. So worth it. 3-4 fat cloves of garlic. 1 kilo of fresh tomatoes – roughy chopped, if you’re crazy like me and like to de-seed your tomatoes, well don’t let me stop you (You can substitute fresh tomatoes with good quality organic Passata, with fabulous results – also cuts down on cooking down when you’re up against it). So first of all what you need to do is find yourself a big old pan and dry roast the following : cumin, coriander seeds, seeds from the black cardamom pods, black peppercorns – till everything is lovely and fragrant, about 3-4 mins. Now transfer all these lovely roasted spices in to a pestle and mortar and grind everything up into a smooth powder. To this add your garlic, ginger, chopped shallot, and grind everything up into a smooth paste. Next put your ground spices, and salt in, and mix everything together. Thats your spice paste ready. What you need to do now is put your lamb mince in a big enough bowl, add your home-made-extra-delicious-spice-paste and some of that chopped coriander. Now comes the fun part: you basically need to make sure that all the spices are evenly distributed throughout the mince, and you could use a big spoon, some people use forks etc but seriously the best way to do this is to get stuck in there with your hands. Go on. You know you want to. So once everything is all mixed up, (and take your time. In many ways this is the most critical step. We don’t want lumpy masala in your koftas now, do we?) wash your hands and pour 2-3 fingers worth of water in your pan and put it on a medium flame. What you are going to do next is use your hands to shape your mince into oblong “balls”, and drop them in to the water. Once all the koftas are in, and the pan comes to a boil, cover, simmer and let it be. For now. While the koftas are doing their thing, take another pan, and add a good glug of oil to it. Then add your sliced shallots and fry till they are soft and translucent – about 4-5 minutes. To this add your crushed garlic, and fry for a minute or two till fragrant. in goes the cinnamon/ cassia stick. (You could add a bit of turmeric at this point, but I don’t because I like my tomato sauce to be really really red! Also you could put some chilli powder in, if you fancy a hotter sauce.) Next add your tomatoes and fry some more. Sprinkle of salt, cover, turn the heat to med-low and let the tomatoes sweat. You basically want to fry them down to the point where all the water’s gone and you can see oil in the pan. So when you get there and your tomatoes are nicely fried all you need to do is pour them all over the nicely simmering koftas. Give everything a good old stir, bring the pan back to boil, cover and simmer for another 10 mins or so. And there you are. Perfect Koftas. Lovely Sauce. Please tell me you remembered to put the rice on? Yes? Good. So usually one vegetable will have one name in one language, yes? In English a tomato, for example, is a tomato, a carrot is called a carrot, and an onion an onion. Oh and then there are some that are called by two different names, in the same language, depending on where you are. When I first came to this country, for example, no one knew what I was talking about when I asked for capsicum, because here they call them peppers – green, red, yellow, orange. Coriander is apparently called cilantro in America etc. And then there are aubergines. Or eggplants. Or brinjals. *eye roll*. For the longest time I thought these were all different varieties. And in as much as there are white/ yellow eggplants etc, maybe that’s true. In any case I’ve made my peace with all these names, though I have to say I prefer the Kashmiri “vaangan”. And that brings me, quite neatly, to Kashmiri tchoek vaangan. These are baby aubergines cooked in a spicy tamarind sauce. No onions. No tomatoes. And in the Kashmiri Pandit version, no garlic. Fun fact – most Kashmiri recipes don’t use tomatoes, because tomatoes came to the region after these brilliant recipes had already been perfected. Ahem. This is one of those quintessential Kashmiri recipes – up there with RoghanJosh and Yakhni. There aren’t many purely vegetarian dishes that get Kashmiris going, but this is definitely one. Should we get to it then? 1 kilo of baby aubergines. Washed. The idea is to leave the stems on, and cut them lengthwise twice, so you have four long slices, still attached at the stem. Easier than it sounds. Believe me. 2-3 fat cloves of garlic. Crushed. About 1-2 teaspoons of tamarind. You can use fresh whole tamarind, dried, paste, all work. You can substitute this with lemon/ lime juice, even vinegar. This is where the tartness comes from. So first of all you take a pan full of boiling water and drop your washed, slices aubergines in, just long enough for everything to come back to the boil. Then using a sieve, or a colander, drain all the water out and let the aubergines dry a bit. In another pan put your tamarind in with some water and bring to boil. Then simmer and cook till the pulp separates from the stones and you have a fairly homogeneous tamarind-water. Sieve to get rid of the stones and skins, and set aside. Next heat a generous amount of oil in a thick bottomed wide pan. In to this add your blanched, drained aubergines, in a single layer. You’re basically trying to deep fry them, on all sides, without actually deep frying them, and making sure they don’t break in the process, so go easy with the stirring. Once you’re happy with your aubergines take them out of the pan with a slotted spoon and keep aside. Now in the same pan add your cumin, Kashmiri chilli powder, turmeric, and garlic. In the Kashmiri Pandit version of this garlic is substituted with asafoetida. Fry everything together till fragrant – 2-3 minutes, then add a little of the tamarind water and cook it down, then do this again, and one more time, till you’ve used up all your tamarind water. Now return your aubergines to the pan, making sure to coat them in the sauce. Add some water, not too much, because the idea is to cook it all down without turning the aubergines in to a pulp. To this then add the black cardamoms, cassia/ cinnamon, fennel and ginger powders. Salt to taste. Stir everything in. Bring it all to boil. Cover. Simmer, till the water is all gone and your aubergines and soft and cooked through. A bit of coriander to garnish, if you like, and you’re done. This is served with, yep, lots of white fluffy rice. Usually alongside at least one meat dish. But it’s okay, you focus on the aubergines. Ahem. Sliced, lengthwise, twice, still attached to stem. In they go, in to boiling water. Bring the pan back to boil. Tamarind, water, and cook it down. And turn and fry. Them remove from pan and keep aside. Add small amounts of tamarind water, which you cook down. A few times. In go the fried aubergines. Add water. These go into the pan next. Bring to the boil. Cover. Simmer.